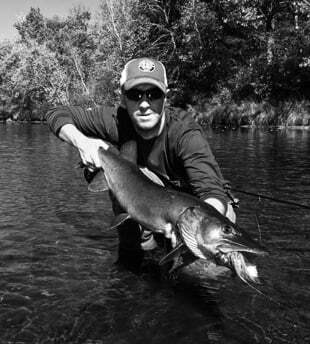 Brian with a fine specimen of North America’s top aquatic predator. A look at Brian’s life over the past decade or so demonstrates just how right his grandfather was. After a childhood spent tying flies and plying the West Duluth brook trout streams, Brian was selected for the US Flyfishing Youth Team, where he honed his fly fishing and fly tying skills with some of the world’s best and finest. Then the muskie bug hit, and Brian took his place in the front guard of what has more or less been an Esox revolution in this country. 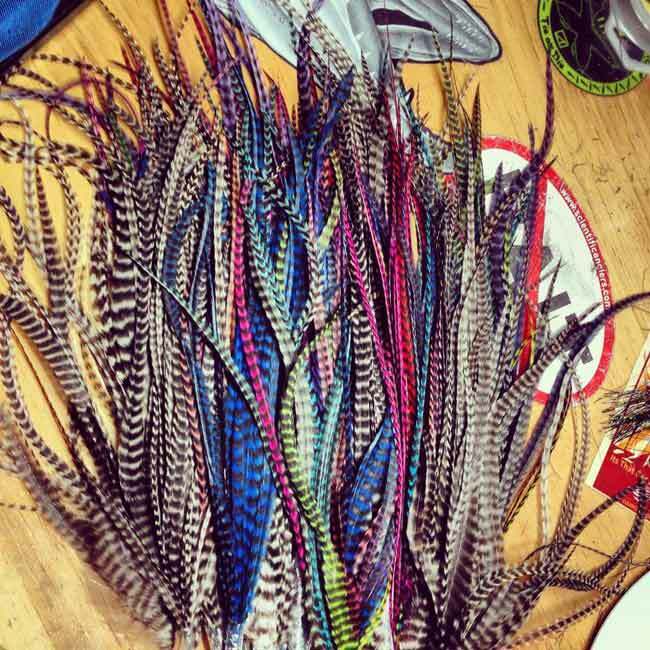 These days, Brian ties custom musky flies some 340 days a year (he goes through 12 spools of thread a week) and purveys coveted Musky Bacon—his hand-selected, custom-dyed streamer saddles feather. All in addition, of course, to fishing the bejeezus out of his homewaters of Northern Minnesota and Wisconsin. With an increasing number of people getting into large flies–be they for musky, pike, or trophy trout—we thought it was a good time to sit down and pick Brian’s brain about tying food for the biggest boys on the block. I started out by asking Brian–who also ties incredible trout dries and nymphs—how the mindset of tying big flies differs from whipping up the small stuff. BB: With trout you match the hatch. Muskie tying is more of a free-style event. You don’t have to tie a size 16 Adams with perfect wings. It’s more of a blank canvas. There are a lot of guys doing great new things: Chris Willen, Nick Granato, Eli Berant. These are the formative years for muskie fly tying. It’s a whole new world. MC: A lot of people new to muskie fishing balk when the see the price of flies–15, 20 dollars and up. How should they understand that price? BB: Well, the first thing to take into consideration is time. Even when I’m in production mode, a double—that is, an articulated fly with two parts—takes anywhere from 45 minutes to an hour and fifteen. So that one fly took an hour of a craftsman’s time. Second thing is the materials. Muskie flies eat up a ton of materials, and some expensive material at that. A single good musky hook alone retails for almost as much as some dry flies. Also, a top-grade musky fly like one tied by myself or some of the guys I just mentioned is designed not to catch one fish but multiple fish. There’s nothing that takes as much abuse as a muskie fly. I now tie all my flies with double wire—a method of articulation I learned from Chris Willen. If you’re fishing one of our flies, and for some God knows what reason one of the wires fails, you have a back-up. You’re not going to lose that fish. Lastly, our flies track well–they move like a real, living fish. You can go out and spend ten bucks on materials and an hour and a half at the vise and still have a fly that just doesn’t swim right. It’s hard enough to get a muskie to eat. We don’t need to make it harder. MC: Let’s say someone wants to get into the business without tying their own flies just yet. How do they set up a custom order? A quartet of big flies ready for action. The singles (bottom) are 9-weight country, the doubles (top) are better matched with an 11 weight. BB: They should get in touch with me and be prepared to talk about the water they fish. I’ll often do research on forage fish that will help me pick the right color combinations and profiles. Profiles can vary quite a bit, from a very flared, panfish-type shape to a less flared, more streamlined sucker shape. Bass is kind of in between. One of my own favorite patterns is green on top and white on the bottom. I keep the topmost fibers more flared than the white fibers—again, it’s a matter of paying attention to thread wraps. That particular fly represents a largemouth bass. I once caught two muskies on three casts with that fly. It’s a keeper. MC: Let’s talk materials for the guy looking to tie his own. Bucktail is king among muskie material, but not all bucktail is created equal. 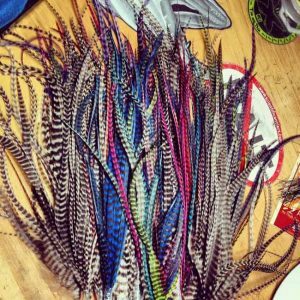 What should a tier look for in a good bucktail? BB: First of all, no two tails are the same. When you go to a fly shop, you need to pick through each one. If they don’t let you do that, then move on the to next shop. Unless you really, really know who you’re buying from, you need to see those tails in person. The thing you’re looking to do is pull the fibers apart to see where the tips line up. Lined up tips and long fibers equals a good muskie tail. It’s important to remember that bigger doesn’t necessarily mean better. Sometimes you can get a big buck tail with short, stiff, uneven fibers. You want to pass on that. Length of fiber is not necessarily associated with the size of the overall tail. Start paying attention to tail fibers and you’ll see what I mean. The dyeing process is also something that effects buck tail quite a bit. Black dye, for instance, really burns the hair—stiffens and shrinks it. Good black buck tail is particularly hard to find. MC: What are some important things to keep in mind when working with bucktail at the vise? BB: First, pay attention to what they hair is doing. It’ll often tell you how to roll with it. There’s really a learning curve with bucktail—you’re going to need to tie some flies before you get a sense of how best to work with it. Each clump you tie in will be different and so will require a different thread strategy. Sometimes one side of the clump might be sticking out more than the other and you need to put some extra thread wraps on that side. Don’t be afraid of an asymmetrical wrap. Again, the hair will tell you what to do. Sometimes it tells me to tie a fly off in the middle of the process and put it aside, so the hair can flare and settle into the thread. Speaking of thread, I like UTC 280 Denier. It gives you just a little more leverage than 210. MC: The next part of the big fly equations is saddle feathers for the tail. How do you go about selecting your Musky Bacon? Salty, fatty food for Esox everywhere. BB: The best tail feathers, like the ones I distribute, have thin stems that make them very supple—it’s that suppleness that makes for movement on the strip as well as on the recovery. If you’ve got a batch of feathers of varying levels of quality and you want to identify your best feathers, grab the whole clump by the stem bases and turn it sideways so its parallel to the floor. The feathers that droop down to the floor most severely are your best feathers. MC: Does it matter how you tie them in? BB: In general, I tie them with the bright side out—I want that visibility and that sheen. But there are other time, say, when I want more of a kicking motion, that I will tie them curving outwards. It’s a subtle difference but sometimes it can be important. A lot of guys skimp on tail feathers, too, and you don’t want to do that. You’re looking for 4-6 feathers per tail. MC: Are you working with any distributors? BB: Yes. 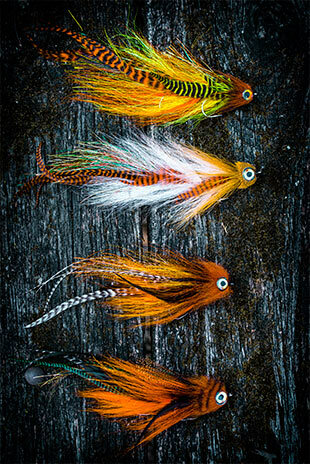 My Demon Series flies will soon be available through Montana Fly Company. MC: Last question: why do you love muskies so much? BB: I love them because you’re hunting them and their hunting you. You’re hunting each other. It’s a real primal game. Bergeson’s Demon as big as our column will allow but still far from life-sized. We leave you with a sample of what goes into each and every musky fly. Below find the requisite materials for Brian’s Dirty Demon, in order of their application. Note that the image and recipe are for a single, unarticulated fly.